It's reading week, and since I have some time for things like basic living-space maintenance, I'm starting to do a long-desired book purge. I have four book cases in my room and they are full and overflowing onto my desk, the floor, and other flat surfaces; and recently receiving a gift card for a bookstore (more books!) has made me realize that I really don't have enough space to keep acquiring books without letting some go as well. Too, I've been thinking about which books I'll take with me when I move out of my parents' house, probably in the next couple of years. One shelf's worth? One bookcase's worth? Almost everything or just the most beloved? It's a hard decision both in terms of space now and future space, but what I think it boils down to is that I don't have space to waste on books I don't love. So, I purged! First to go were several sets of doubles -- I don't really need two copies of Anne's House of Dreams, do I? Didn't think so. And after that, off go the books I don't love. Adios, everything written by Henry James. Sayonara, Hemingway. Goodbye, random mystery anthologies I'll probably never get to. The Nanny Diaries, I read you a few times and now I don't need to do that anymore. They'll be picked up by a local charity that takes your stuff and sells it to Value Village and whatnot. I still have some large piles of books up for reading & review, but I have a feeling that most of those will go the way of the dodo once I've posted about them... so I guess that in a few weeks I'll need new boxes. You know what? It feels great. Later this week I'll post on phase two of my project, which is actually re-shelving all my books by category instead of all helter-skelter. Have you weeded your collection lately? How do you decide what stays and what goes? Before I moved to Madison, I did a major book purge at my parents house. I did a keep 2 lose 1 game and managed to get rid of about 100 books. I didn't bring all of my remaining books to Madison, but that's because my parents haven't made me give up my room at home yet. As soon as that happens, I'll have to deal with all of them. I'm just glad it's not happening quite yet! but moving is a good reason to purge, I do that regularly. Sometimes I over-purge and re-acquire things I lost in earlier purges. I've learned from that to be a bit more careful in the process. Many people benefit from my moving purges. I've been purging lately too! My policy is: any books I've read and don't either a) plan to read again or b) deserve a place in my permanent library get put in a bag in the basement. As long as I don't think about it, I then either donate it or sell it to a used bookstore. My problem is that I haven't read most of the books on my shelves! I've been trying to give each book 50 pages, and if it's not holding my attention (if I'm not trying to find time to be alone with it, as a friend said! ), it needs to leave my house. It's working, but very slowly, since if I really like a book, I have to finish it before I move on! Kim -- keeping two and losing one sounds like a good way of going about it. I didn't do anything so systematic -- just a took a look at every shelf in turn and pulled out things I didn't like. Glum -- I too have benefited from your purges. And now have purged some of those books as well. Eva -- That's a good way to do it, to keep things out of sight. I actually did a smaller purge a few weeks ago, of about twenty or thirty books, but I hadn't gotten rid of any of them yet. When I transferred them to the bigger box last night, I made sure not to look at any of the covers! I'm already forgetting what I got rid of. Erin -- good luck! Even going about it slowly is good, I think. Doesn't it feel good to just get rid of stuff sometimes? I have a hard time parting with books for some reason, though I know I must. Especially now with new books entering our small, already cramped townhouse all the time. I think I'll start with the college textbooks. I kept them because I planned on going to graduate school, but that never happened. So why do I still have them?? purging can be a good thing! I cleaned out my books last weekend because I didn't have any room left and books were stacking up everywhere. I ended up purging 25 books - they were all fluffy Christian romance novels that I collected years ago and had read many times. I figured that someone else might enjoy them, and if I want to read them again I can check them out from the library. The biggest factor in my decision was that I haven't read them in years. 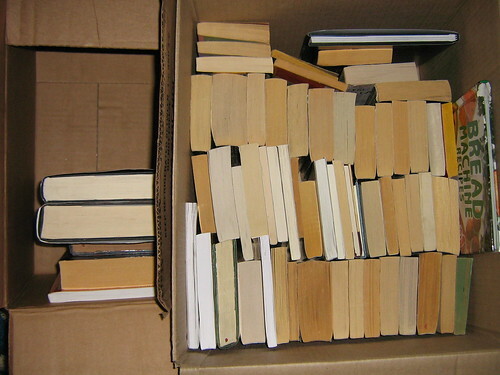 I purge every once in a while, too, because I too think it's a waste of space to keep books I don't love. You made a wise decision. Alyce -- my trouble is that even though I haven't read things in years, I'm still convinced that I will again. Someday! I just know it! ... and then everything stays on the shelves. ach! When we moved recently, my mum packed up all the books she wanted to keep, but didn't plan on reading soon. Now we have two enormous boxes of books in our rental storage that will probably collapse and create a black hole when we move them. I, however, decided to keep all my reference books, my most beloved (Harry Potter! LotR! Twilight! ), and unread books in my room. A few others I packed in boxes. We also went through my grandmother's house recently. We gave away hundreds of books. Kept a few hundred more. Took home some others. It was quite fun, if not asthma-inducing. Purging is almst heart-wrenching for me, but I've currently got my books purged down to two bookshelves, not counting the books that my mom has held on to for me (not necessarily because I don't want them, but because she wants them more :P). When I purge it comes down to a few facts. Is it a double? It's gone! Is it something that I've had for more than a year and is still on my 'Maybe I'll read it' list? Gone! And if I've read it before, is it something that I have a desire to read again? If I loved it and stil lwant to read it over, it will stay. I can read a good book ten thousand times and still love it. And finally, is it something that I want to be able to share with someone in the future? I've kept a few books, not because I necessarily want them, but because I think about my nieces and nephews and maybe even my future children and think that maybe I should keep it for their sake. Just because I don't love it whole-heartedly doesn't mean that they won't.